Enjoy your space morning, noon and night. Solair® retractable awnings are the perfect addition to your home, allowing flexibility to make the most of your space. When extended, Solair awnings provide shade and help to define a space. When retracted, your awning blends into the background of your home allowing a more open environment. 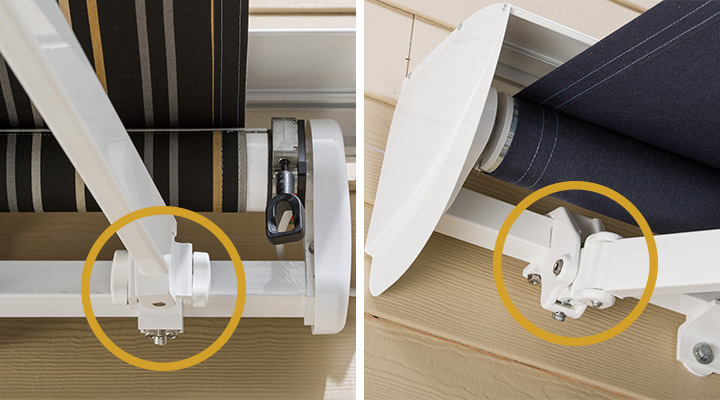 And since our awnings are motorized, you can control your space with the press of a button. Solair retractable awnings definitely create shade for your outdoor spaces, but they do so much more, creating a popular space in the home morning, noon and night. 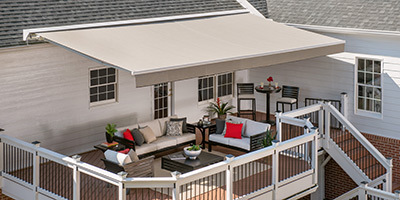 Whether you are eating breakfast outside, spending time with the family in the afternoon, or hosting a party in the evening, Solair awnings create an ambiance, turning your patio into an outdoor retreat. The transformation is not only outside your home. Solair awnings also make a big impact inside your home. An extended awning can block the sun and prevent damage to furniture, drapes and flooring as well as reduce energy consumption by lowering temperatures inside your home. The direction your home faces can tell you a lot about your shade needs. If you need shade all day long in your outdoor living space, your house faces south and needs a wider width shade solution. If you only need shaded protection from the sun during the afternoon and evening, your house faces west and needs a shade solution that extends farther out from the house. Your local dealer can help you find the right solution for you. Our line of standard patio awnings comes in the most common widths to cover patio or deck spaces. 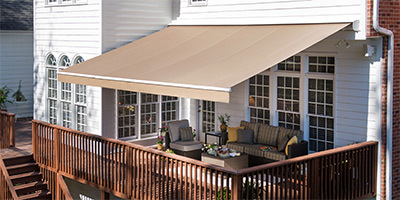 Standard awnings come with a choice of two frame colors, and hundreds of Sunbrella fabrics options. Contact a local dealer for more information. If you are looking for an awning that is tailored to your exact space, a custom patio awning is the way to go. These awnings are available in custom sizes to perfectly fit your space, and offers more choice in frame color. With a custom awning you also have hundreds of Sunbrella fabrics to choose from. See a local dealer for more information. Window awnings bring the technology of Solair awnings in a compact product for window applications. Window awnings add to the architectural aesthetic of your home, help to control the indoor temperature, as well as protect the interior from sun damage. What makes a Solair Awning? Designed to allow flexibility during windy conditions. 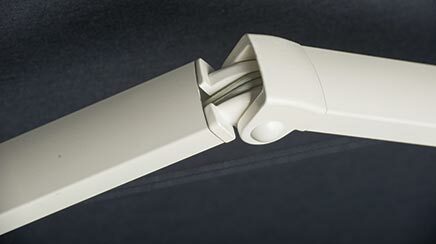 Offers strength and flexibility to keep fabric taut and beautiful for the life of the awning. A pivotal point allowing adjustment of the awning's slope while providing strength. Protects awning in the retracted position and offers a more finished look. 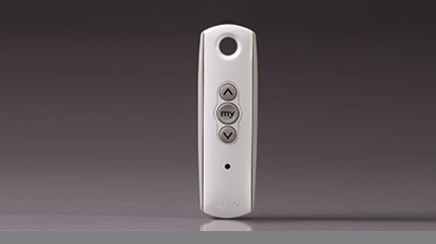 Offers motorized use at the touch of a button. 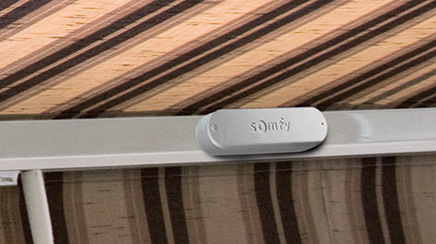 Allows control of the awning's projection with the push of a button. Provides protection by signaling the motor to retract your awning in windy conditions. 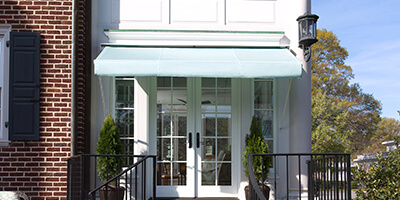 Solair awnings are made using Sunbrella fabrics. Sunbrella carries the Skin Cancer Foundation's Seal of Recommendation when used along with your skin care regimen. And with hundreds of styles to choose from, you are sure to find the right look for your home. 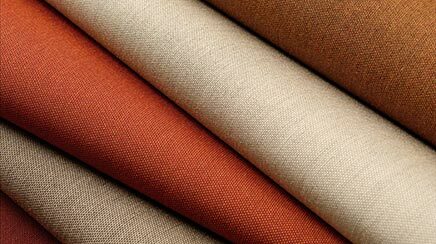 Sunbrella fabrics. Note: Parts may vary depending on model. Visit a local dealer to learn about key components in detail. 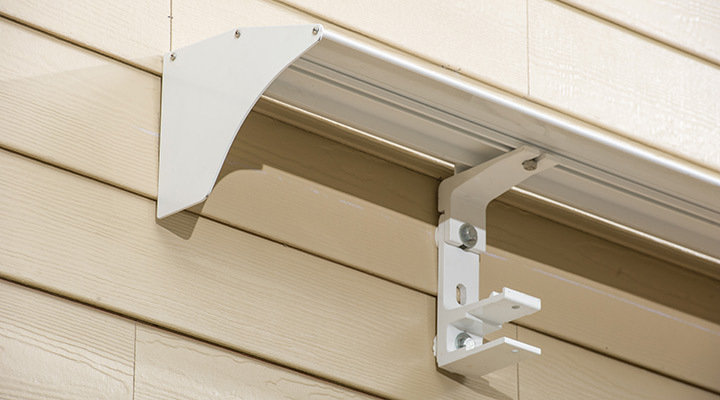 How an awning mounts on your home. Solair awnings are installed by trained professionals, and can usually be installed within two hours. Depending on the architecture of the home, an awning can be installed in one of three ways: a wall mount, a roof mount or a soffit mount. Your local Solair Dealer can help you determine which option is best for your home. Adjusting the pitch of your awning is easy. 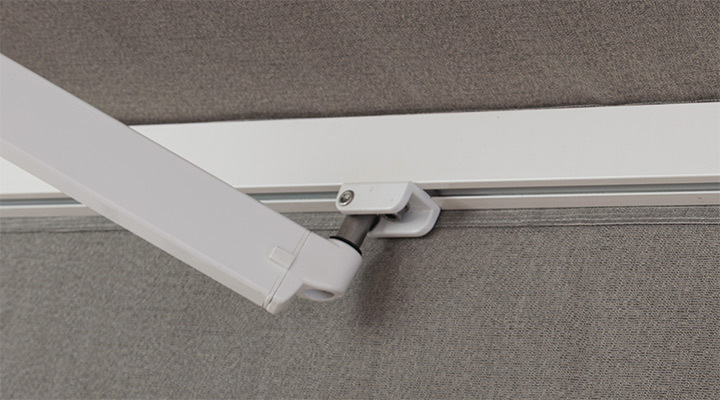 First extend the arms of the awning and loosen the side locking nuts on one of the arms. Then loosen the top hex bolt. Raise the awning to take the pressure off, and then tighten or loosen the bolt. Tighten the side locking nuts back and the hex bolt. Watch for more details. 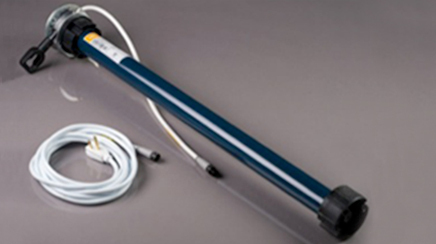 Maintaining the wind sensor on your Solair awning is important. First, slide the sensor off of the front bar. Remove the electronics from the outer shell, and press the red battery tester button. The light will blink if the battery charge is sufficient. Adjust the wind sensor on the sensor dial. Watch for more details.